Welcome to Barkman & Smith Physical Therapy’s resource on adult shoulder fractures. The shoulder is a region of the body rather than a bone or even a joint. Doctors refer to this area collectively as the shoulder girdle. There are four bones and three joints in the region. Injury to any one of them may be considered a shoulder fracture or dislocation and all affect the function of the shoulder and arm. 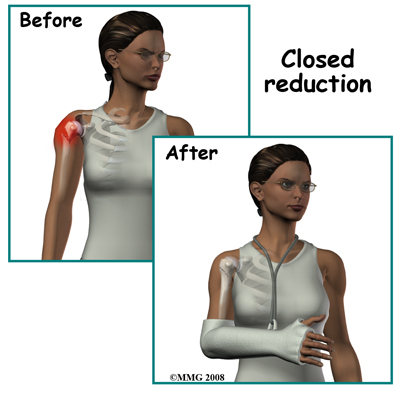 The overall function of the shoulder is to provide a secure base for the movements of the arm. The base must be strong to bear the load when you lift something and mobile enough to position the hand anywhere in space from thigh level to above your head. Many of the forces on the arm are transmitted to the skeleton by muscles. The only point of bony contact between the arm and the rest of the skeleton is between the collarbone and the breastbone. Most fractures in the shoulder region occur in bone which heals well, so the main concern with the management of shoulder fractures is to make sure the shoulder will continue to function well after healing. Injury to any part affects the function of the entire linked system. The bones of the shoulder region are the sternum (breastbone), the clavicle (collarbone), the scapula (shoulder blade), and the humerus (arm bone). 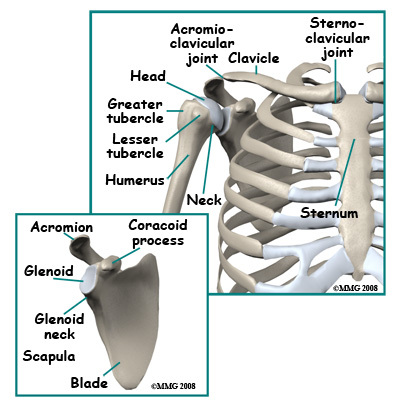 The joint between the sternum and the clavicle is called the sternoclavicular joint. Movement at this joint allows you to shrug your shoulder, pull the shoulder back, or bring it forward. The tip of the shoulder blade is called the acromion process. This piece of bone juts out over the shoulder and forms a joint with the collarbone called the acromioclavicular (AC) joint. The AC joint supports the shoulder blade and allows it to pivot and rotate. Most of the movement at the shoulder takes place at the joint between the shoulder blade and the humerus. The scapula forms a shallow cup called the glenoid cavity (or fossa). 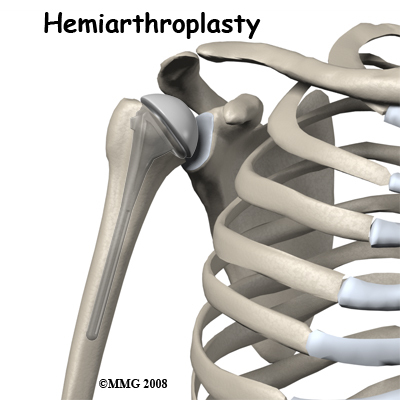 The round head of the humerus fits into this cup and forms the glenohumeral joint. 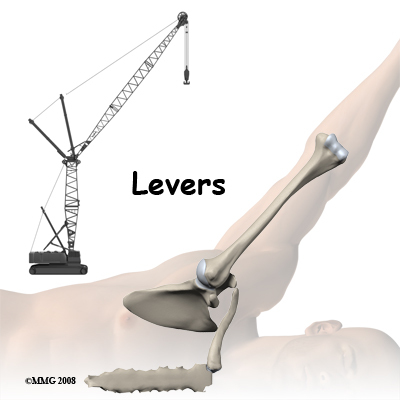 This joint is what is referred to in everyday language as the shoulder joint. This joint allows a large amount of movement including forward elevation (bringing the arm forward), abduction (bringing the arm out to the side), and rotation (allowing the hand to be rotated inwards 90° to the waist and outward to 90°). Although these movements take place at the glenohumeral joint movement at the other joints supplements these motions. 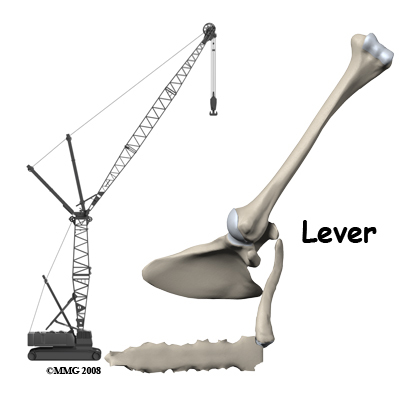 Arm movement can be compared to a crane where the main movement occurs at the end of a lever. Most shoulder movements involve a fluent combination of movements at all three joints of the shoulder. This can be appreciated by feeling the movement of the joints of the shoulder when the arm is moved. You can easily feel the bones of the shoulder girdle. The sternum is in the front of the chest just under the skin. It passes from the base of the neck at mid-line down between the breasts. The sternoclavicular joint is at the upper end of the sternum just off mid-line. Movement at this joint can be appreciated if you shrug your shoulder. The clavicle also runs just under the skin for its whole length so it can be easily felt. It is most prominent if the arm is allowed to hang down with weight in the hand. 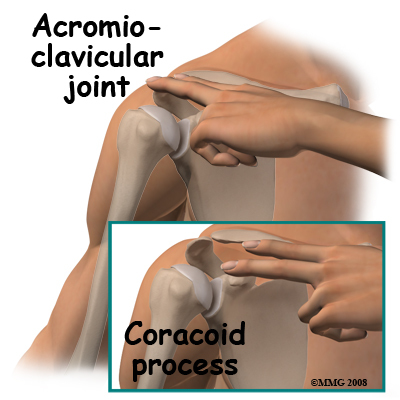 The acromioclavicular joint (AC joint) is not easy to feel. The acromion process is a bony prominence of the shoulder blade situated at the upper and outer part of the shoulder, just under the skin. If you place three fingers (of the opposite hand) on top of the shoulder the AC joint will be beneath them. If you now swing the arm forward and back you will appreciate movement (rotation) between the acromion and the collarbone. The other parts of the shoulder blade that can easily be felt are the coracoid process, the spine of the scapula, and the tip or distal pole of the shoulder blade. The blade itself is mostly covered with muscle. The coracoid process is a site of origin of muscles and ligaments. If you lay your opposite hand's index finger along the collarbone and press with the middle finger you will feel a hard lump of bone which does not move when you rotate the shoulder. This is the coracoid process; if you bend the elbow you can feel the flexor muscles that attach to the coracoid contracting. These muscles can overact and contract hard enough to pull a piece of bone off of the coracoid process. When the attaching muscle pulls off a piece of the attachment of the bone, it is called an avulsion fracture. The spine of the scapula can be felt by placing the heel of your opposite hand on the collarbone and letting your fingers reach and rest towards your back. Your fingertips will bit sitting on a hard ridge of bone at the back of the shoulder blade with softer tissue (muscle) above and below. This is the spine of the scapula, which is the boundary between two important muscles that rotate and stabilize the shoulder. Above the spine of the scapula is the supraspinatus muscle and below the spine is the infraspinatus muscle. They can be felt contracting when you rotate the arm out. 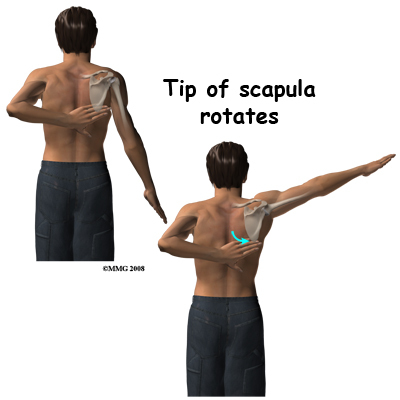 The tip of the scapula can be felt if you put your other hand behind your back and reach up towards the shoulder. Normally you can just touch the lower tip of the opposite shoulder blade. If you now swing your arm out to the side (abduct the arm) you will feel the tip of the blade rotate outwards over the chest wall. This motion between the scapula and thoracic rib cage (scapulothoracic motion) is an important part of shoulder movement and must be recovered if you are to regain full range of motion after an injury. The upper end of the humerus is covered with thick muscle so it is difficult to feel. If you feel the acromion process and move your finger forwards to the front end of the bone then rotate your arm, you will feel the rotation of the head of the humerus through the muscle. The glenohumeral joint is too deep to feel. The nerve and blood supply of the arm is closely related to the bony structures of the shoulder girdle. The nerves exit the spine at the neck and join together to form the brachial plexus. The brachial plexus then runs into the upper arm through the armpit area just under the shoulder joint. The brachial plexus then separates into the main nerves of the arm. The main nerves are called the radial, median, and ulnar nerves, and together with the musculocutaneous nerve they supply sensation and movement to the hand and arm. Injuries severe enough to cause fractures can also damage these nerves causing severe functional defects. The major artery to the arm, the brachial artery, lies under the collarbone and passes into the armpit region close to the nerves of the brachial plexus. It too can be injured in major trauma to this region. The structures of the shoulder can suffer tears, fractures, dislocations, and fracture dislocations. In the elderly, fractures of the upper end of the humerus may be the most common fracture of the region but clavicle fractures are also common as are fractures associated with dislocation of the glenohumeral joint. How do fractures of the shoulder commonly occur? Various forces can cause fractures and dislocations of this region including pulling, impact, twisting, and bending. The result of an impact will clearly depend on the point of contact. By contrast, twisting injuries tend to damage the weakest part of the linked system. Forces such as falls on an outstretched arm create a bending force that is transmitted up the arm and commonly fractures the neck of the humerus. Traction on the arm is a rare but significant cause of injury to the shoulder. For example, a rodeo bull rider binds his hand to the strap round the bull. If he is thrown and the hand remains trapped, the whole weight of the body may be thrown around by the bucking animal. All of this traction force is transmitted through the shoulder causing fractures, dislocations and nerve injuries. Open fractures where the bone fragments are contaminated by an open wound are not particularly common in this region. Nonetheless, this type of open fracture can be caused by stab wounds, major lacerations, or gunshot wounds. 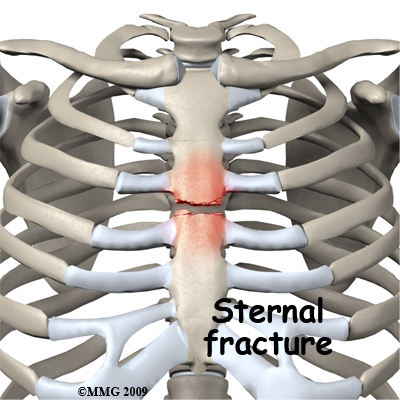 Fractures of the sternum are usually caused by impact against the front of the chest such as that caused by the steering wheel in a motor vehicle accident. Even if they are quite displaced these fractures are likely to heal without causing a problem. The impact is in a dangerous area, however, and a sternal fracture may be an indication that vital structures in the chest may also be damaged. 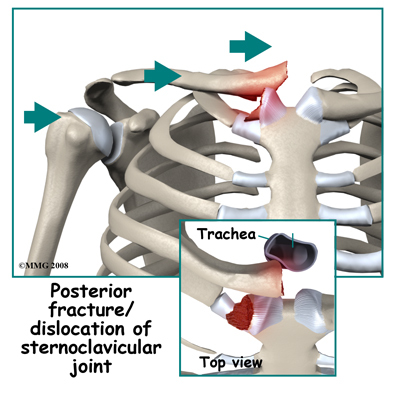 Dislocations and fracture-dislocations of the sternoclavicular joint may be caused by an impact on the region of the joint. Lateral compression on the outside of the shoulder may also be transmitted inward to the joint and force the clavicle to dislocate either in front or behind the sternum. 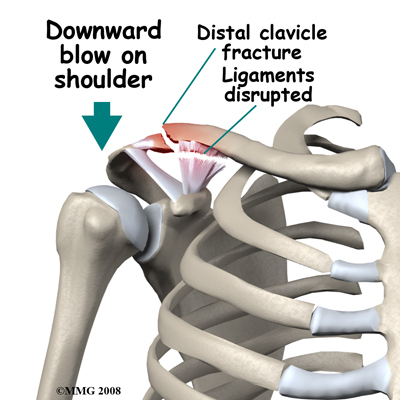 A fragment of the clavicle or the sternum may be broken off as the dislocation occurs. Dislocation behind the sternum may cause serious problems with pressure on vital structures such as the windpipe or the large blood vessels close to the heart. Patients with this injury may need to be transferred to a tertiary center for treatment. The injury is rare and may be quite unstable. The region is more familiar to chest surgeons than most orthopaedic surgeons and it is advisable to have back up from a team capable of dealing with the possibility of damage to large vessels. 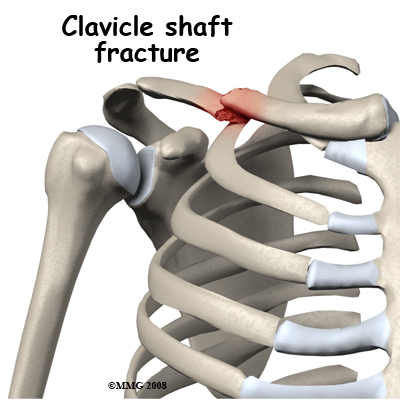 A fracture of the shaft of the clavicle is a common injury and is often caused by a direct impact on the mid-portion of the clavicle. A bending force can also cause it where the force that pushes the shoulder back results in a mid-shaft fracture of the clavicle with the outer part angled back. This can be an open fracture as the sharp end of the broken bone cuts through the skin. Mid-shaft clavicle fractures can also be the result of a fall on the outstretched hand. The force is transmitted up to the clavicle, as it is the link between the arm and the rest of the skeleton. Fractures of the shaft of the clavicle have a good reputation for healing and are often treated non-operatively. Fractures of the outer end of the clavicle are nearly always caused by a downward blow on the shoulder. The arm and shoulder blade are forced downwards breaking the collarbone near its joint with the scapula (the AC joint.) This injury is unstable and usually all the ligaments connecting the collarbone to the shoulder blade are disrupted. The weight of the arm continues to pull the fracture ends apart. Mobility at the fracture site makes it unlikely to heal. For this reason this fracture is usually treated by surgery. 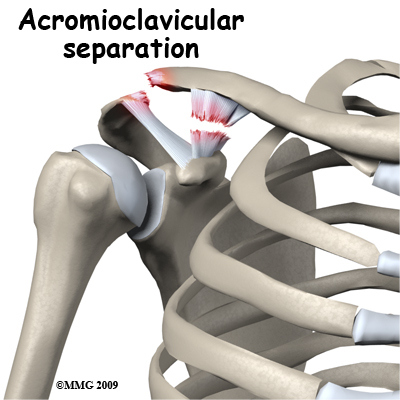 Acromioclavicular separation is usually also caused by a downward blow on the shoulder. In this instance some or all of the ligaments tear but the bone is intact. There is often significant deformity at the joint with the clavicle sticking up like a piano key. The outcome of this injury depends on the degree of ligament damage. When some ligaments are intact the joint will regain its stability and function well. A positive outcome may also occur with more complete ligament tears but it is less predictable. Treatment of significant tears is controversial since the outcome from non-operative treatment may be quite satisfactory whereas earlier methods of surgical treatment had a high incidence of complications. With modern methods of fixation surgical treatment has become more popular. 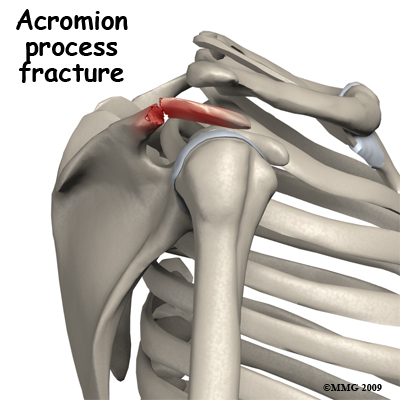 Fractures of the acromion process may be a result of a blow on the tip of the shoulder. Unless the fracture is severely displaced it is unlikely to compromise function of the shoulder joint. Most often this fracture can be treated non-operatively but on occasion it will be treated by surgically opening up the fracture site, replacing the fragment to its original position and then fixing it in place with a screw or other metal implants such as wires, pins, or plates. This procedure is referred to as an open reduction and internal fixation (ORIF). 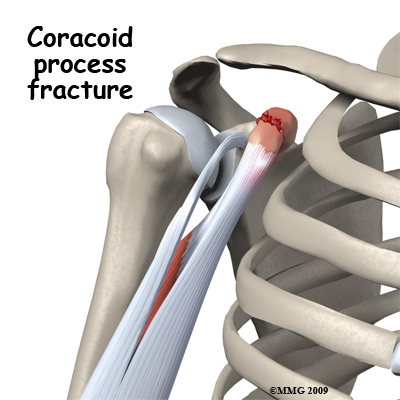 Fractures of the coracoid process are nearly always an avulsion fracture. Two muscles that bend the elbow, including the biceps, originate from the coracoid process. If they are contracting to bend the elbow when the load is suddenly increased and the elbow is straightened rapidly, the muscles may pull off their point of attachment. Usually this can be treated non-operatively. 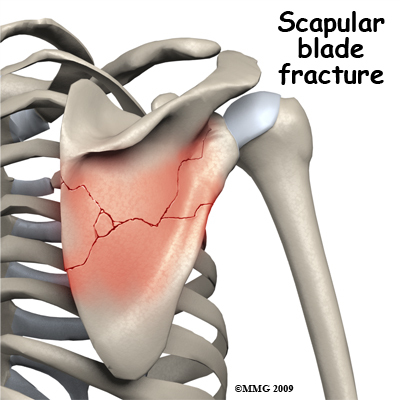 Fractures of the blade of the scapula are usually caused by blows on the back directly to the scapula, often in the context of multiple traumas. The injury itself may be quite spectacular with extensive star shaped fracture patterns, but healing almost always occurs without intervention. A large degree of displacement can be tolerated without loss of function. 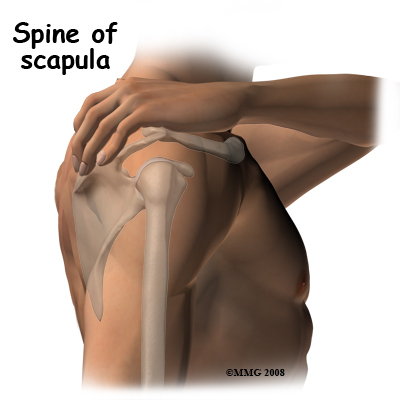 The main function of the blade of the scapula is as a site of attachment of muscle. On rare occasions the healed scapula is so distorted that the normal gliding motion of the scapula against the ribs is affected and the shoulder blade may catch as it moves over the ribs. 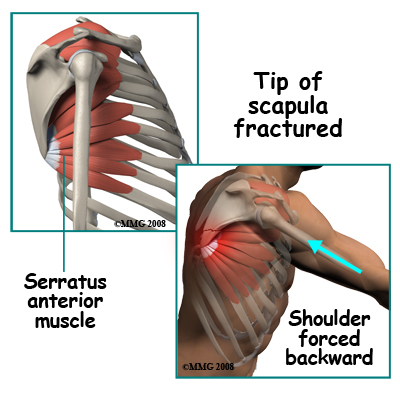 Fracture of the tip of the scapula is usually an avulsion fracture. Powerful muscles attach to the lower tip of the scapula. These muscles act to either rotate or stabilize the scapula against the chest. Since most of the muscles that move the arm attach to the scapula, one important function of the muscles that go between the rib cage and the scapula is to hold the blade still. They tend to "lock" and clamp the scapula to the chest wall. In this situation, if a force on the arm is enough to move the scapula back away from the chest wall, the muscle attachment to the tip is pulled off. Bracing your arm before an impact may result in this injury. Usually it can be treated non-operatively. Fractures of the neck of the glenoid occur as a result of lateral compression forces. A blow on the side of the shoulder is transmitted through the head of the humerus to the glenoid. More rarely a fall sideways with the arm out to the side may result in the same type of injury. A very forceful dislocation of the glenohumeral joint might also cause this injury, but fractures of the rim of the glenoid are more common in that situation. Fractures of the neck of the glenoid are also associated with fractures of the blade of the scapula. In most situations the injury can be treated non-operatively. 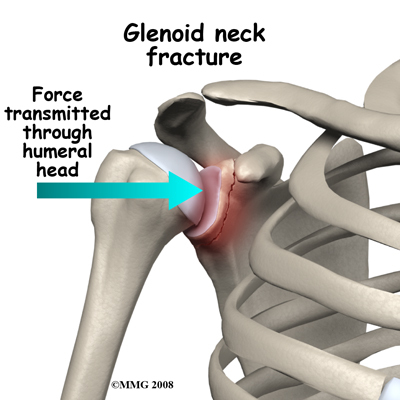 Fractures of the glenoid occur due to the same type of force that fractures the neck of the glenoid. More commonly, a glenoid fracture occurs when the shoulder dislocates and a fragment of the joint goes with it. A fracture involving the glenoid results in an irregular portion of the joint surface. Unless the joint surface is perfectly aligned after the dislocation is back in joint, the fragments are usually treated by surgery (ORIF). Some surgeons may elect to manage this fracture with arthroscopic surgery. 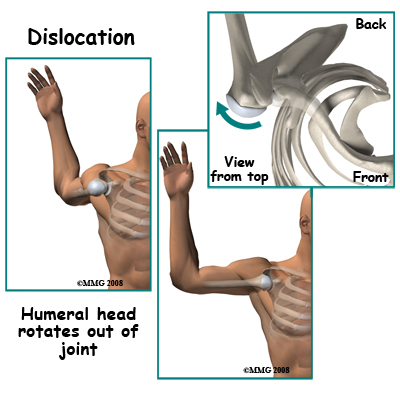 Glenohumeral dislocations result from the shoulder joint (glenohumeral joint) being moved beyond its limits. The most common position causing this dislocation is excessive abduction and external rotation. Simply put, when the level of the elbow is at or above the shoulder level the hand is forced backwards and the shoulder is therefore pushed forward, out of joint, by a "crank-shaft" action. Dislocation backwards also occurs. The humeral head may be fractured or dented from the impact of it hitting the glenoid rim on dislocation. This is very common after an anterior dislocation. This dent is called a Hill Sachs Lesion. Fortunately it is usually small and rarely needs treatment. Damage to the axillary nerve occurs quite commonly with anterior dislocation. It is important to look for weakness of the triceps muscle and numbness over the side of the shoulder after a dislocation or suspected dislocation, as these are signs of injury to this nerve. Fracture and dislocation of the glenohumeral joint is rare. It usually results from high velocity trauma with a severe blow to the side of the shoulder. The head of the humerus is driven out of joint and is also broken off the shaft of the humerus. This injury also has a high incidence of injury to nerves. Since the intact humerus is used as a lever arm to reduce most shoulder dislocations a fracture dislocation is difficult to put back in joint. Very frequently it requires an operation to reduce the dislocation and fix the fracture. Even during surgery reducing the humeral head back into joint can be difficult. The joint surface of the humeral head is often damaged in this fracture pattern and it is a challenge to make the shattered bone stable again. Strictly speaking glenoid rim fractures and greater tuberosity fractures may also be fracture dislocations but they have a very different pattern and outcome. Fracture of the greater tuberosity is an avulsion fracture. By itself it occurs from over-action of two of the rotator cuff muscles - the supraspinatus and infraspinatus. 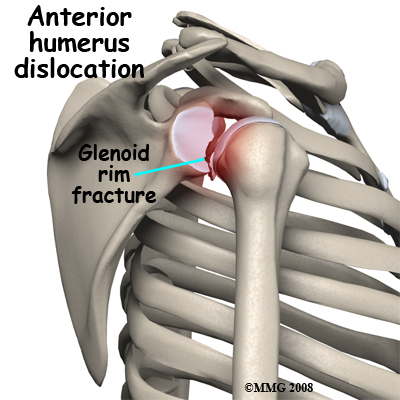 More commonly it happens when there is an anterior dislocation of the glenohumeral joint. One important function of the rotator cuff muscles is to resist dislocation. If the dislocation happens anyway, despite the pull of these muscles, they may pull off a chunk of bone at their point of attachment, which is the greater tuberosity. After the dislocation has been reduced the shoulder needs to be X-rayed again to determine the position of the greater tuberosity fragment. If it is still significantly displaced it will interfere with abduction and rotation of the glenohumeral joint. In these cases it should be surgically replaced in its position and fixed (ORIF). 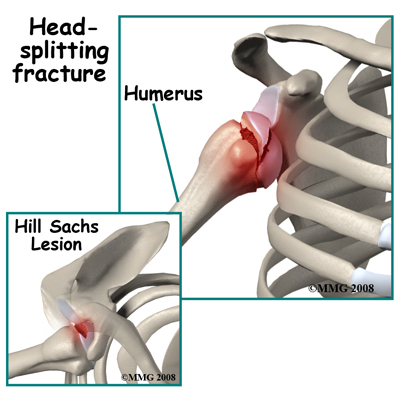 Head-splitting fractures of the humeral head only occur when the glenohumeral joint is dislocated. In a violent dislocation the head of the humerus may be driven against the edge of the glenoid splitting a portion of the head off. This injury creates two serious problems. The split fragment has lost its blood supply and the fracture has damaged the joint surface of the head of the humerus. After the dislocation is reduced, it is unusual for the floating fragment to stay in the correct position. Usually this injury must be treated by surgery either to remove the loose piece or to fix it back in position. Fracture of the neck of the humerus is one of the most common fractures of the shoulder girdle. It usually occurs as a result of a fall on the outstretched hand with the force being transmitted up to the shoulder. It is a common fragility fracture in the elderly occurring in combination with osteoporosis. The injury can also occur in younger people as a result of more severe forces such as motor vehicle accidents, falls from a height, and collisions in sports. The pattern of fracture in the region of the neck of the humerus can be quite variable. The simplest pattern is a transverse fracture through the neck region. More complex fractures involve other portions of the proximal humerus as well as the transverse fracture. If both the greater and lesser tuberosities are broken off, the blood supply to the head of the humerus is threatened. Due to a range in severity, there are a number of potential ways to treat a fracture of the neck of the humerus ranging from symptomatic treatment only through closed reduction, closed reduction with pin fixation through the skin, ORIF, and in selected cases, a shoulder replacement. What symptoms do shoulder fractures cause? The most prominent symptom after a fracture is pain localized to the site of the fracture. This area will also be tender and will swell up very soon after the fracture. There will usually be a history of an accident to cause the fracture and it may be helpful to remember the details of how the injury occurred. Bruising that spreads down into the arm will be evident within 24 hours. Normal function of the shoulder is impossible and it may be painful to move the elbow or hand. Movement of the arm or shoulder may produce pain transmitted up to the fracture site. With a dislocation there may be deformity at the joint. Moving the joint will be painful or impossible. Even after treatment, symptoms of pain made worse by movement, swelling, bruising, and tenderness will persist for several weeks after the fracture. These symptoms result from injury to the soft tissue (the muscles, ligaments, and tendons) in the region of the fracture as well as bleeding into the tissues. The symptoms resolve slowly as the body re-absorbs the bleeding and heals the torn tissues. How will my shoulder fracture be evaluated? First aid for people who may have suffered a shoulder fracture will normally consist of treating for shock, splinting the shoulder with a sling, and rapid transfer to the hospital. In the Emergency Room the focus of the team is on treating shock and making you comfortable, then establishing the extent of the injury (diagnosis) and consulting an orthopaedic surgeon if necessary. The whole region needs to be examined so clothes must be removed. Often this requires cutting them off to avoid hurting you or doing more damage. The bony parts of the shoulder girdle will be gently palpated to find the site of maximum tenderness and a note will be made of any wounds, swelling, or bruising. Wounds and abrasions will be dressed. Any areas of numbness or muscle paralysis will also be noted. The circulation to the hand will be checked. X-ray evaluation of the injury will be guided by the clinical evaluation of the fracture site. Different views are needed for fractures of the sternum, collarbone, shoulder blade and glenohumeral joint. Some fractures of the shoulder girdle can be treated without referral to an orthopaedic surgeon. This will differ from place to place and be the decision of the Emergency Room physician. The orthopaedic evaluation will include a repeat of the history of the injury, a review of your general medical status, and a careful examination of the shoulder region. The x-rays will be reviewed to make sure they are complete and that no further injuries are suspected. A computerized tomography (CT) scan of the region or magnetic resonance image (MRI) may be ordered in cases such as a fracture dislocation of the sternoclavicular joint or where the injury is complex (e.g., fracture dislocation of the shoulder). The treatment options will be discussed with you taking into account your general medical status, your expectations, and your normal level of activity in work and sports. With such a wide variety of injuries to the shoulder girdle it is not surprising that the treatment options are widely variable as well. Non-surgical treatment is employed commonly. Nearly all fractures of the sternum, the collarbone, the blade of the scapula, the acromion and coracoid processes as well as the neck of the glenoid are treated without attempting to improve the position of the fracture or fix it. Symptomatic treatment usually includes using a sling to limit movement of the shoulder and for pain relief as they prevent the weight of the arm dragging on the painful part. Most slings are suspended round the neck, which unfortunately can get uncomfortable. An arm immobilizer is available in some hospitals; this goes round the chest and supports the forearm and the arm just above the elbow to ease this discomfort. Your doctor will advise you on how long you are required to use the immobilizer, as each injury can be different depending on the fracture severity and the progression of healing. In some cases a closed reduction is needed followed by splinting. Under anesthetic, but without opening up the fracture site, the fracture (or dislocation) is manipulated into a better position and alignment. This is typical treatment for glenohumeral dislocation. Avoiding excessive shoulder motion for a period of weeks usually allows the ligaments to heal without being stretched and may reduce the chance of recurrent dislocation in the future. Displaced clavicle fractures are often treated in a figure-eight brace, which braces both shoulders back and may improve the position of the fracture. Some humeral neck fractures are angulated initially and may be treated by a closed reduction to improve the position followed by splinting in a sling. In some fractures of the humeral neck, the fracture is unstable meaning that it is at high risk to displace again after closed reduction. This can be prevented by inserting pins through the skin and across the fracture under x-ray guidance. When the fracture has partly healed, these pins can be removed without the need for an anesthetic. The usual reason for treating a fracture by surgery is that the results of non-operative treatment would not be satisfactory. The most common reasons for this decision are residual deformity, irregularity of the joint surface, or bone fragments likely to interfere with movement. In most situations the surgeon chooses to open up the fracture site to replace the fragments back in the correct position. Open Reduction Internal fixation (?ORIF) is often employed for glenoid rim fractures, fractures of the outer end of the clavicle, displaced fractures of the neck of the humerus, fracture dislocations of the shoulder, and for fracture dislocations of the sterno-clavicular joint. 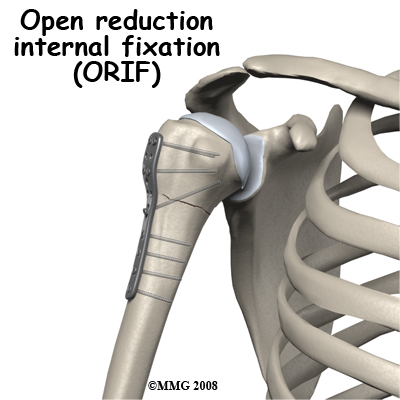 ORIF is used less often for fractures of the shaft of the collarbone, glenoid neck, or displaced avulsion fractures of the acromion, coracoid process, distal pole of the scapula or greater tuberosity. 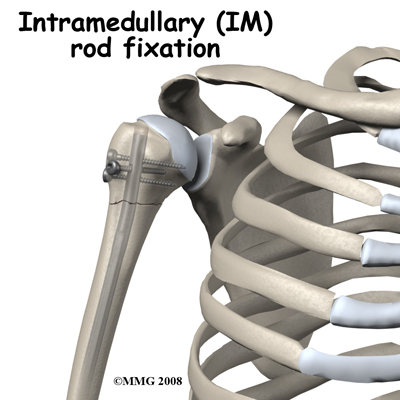 Intramedullary (IM) rod fixation is a more complex form of ORIF and is sometimes used for unstable fractures of the neck of the humerus. This form of fixation involves placing a rod down the shaft of the humerus. After most forms of fixation of shoulder fractures, a sling is used for a few weeks to help with pain control and reduce the load on the healing area. In severely shattered fractures of the neck of the humerus the blood supply of the head of the humerus is lost and the bone supporting the joint surface will die. In this situation a decision to do an artificial joint operation may be made. The head fragment is removed and replaced with a metal implant that is fixed inside the shaft of the humerus and has a rounded "head" the same size and shape as the natural one. The remaining fragments are fixed back to the implant and the shaft of the humerus. When this heals the shoulder should be free from pain and have an acceptable range of movement. Percutaneous pins (and external fixation devices) are always removed as soon as possible. This can be done without a general anesthetic. Other implants are removed at a secondary operation of "hardware removal" only if they are causing symptoms. If the screws or plates are directly under the skin or can be felt, they may be uncomfortable. The prospect of an operation for implant removal is worrying to patients who fear that it will be as painful as the original fracture treatment. Much of the pain from the original fracture comes from torn muscles, broken bones, and bleeding. Since the bone and muscle damage have both healed by the time of the second operation, the discomfort after hardware removal is much less and recovery is rapid. The operation does need an anesthetic but can often be done as outpatient, or day surgery. Bone takes six weeks to heal to 50% of its normal strength, three months to achieve 80% strength, and continues to get stronger for up to 18 months post injury. X-rays will be taken to assess the progress of healing. If your fracture has been immobilized, rehabilitation with a Physical Therapist at Barkman & Smith Physical Therapy generally begins once the immobilizer is removed around 4-6 weeks post injury. While you are immobilized simple finger movements, elbow and neck range of motion exercises as well as pendular exercises (with the immobilizer removed), will be your only exercises. Pendular exercises assist with pain, help to maintain some shoulder range of motion, and assist in preventing unwanted scar tissue forming in the joint. These exercises are performed by leaning forward or to the side, letting the arm hang clear of the chest, and then initiating movement with your trunk so that the dangling limb passively and gently moves. This action provides some traction to the glenohumeral joint, which aids in pain relief, and also assists the shoulder into a relative elevated motion (in relation to the trunk.) It is important that the pendular activity is done as passively as possible without initiating motion from the shoulder muscles. The exercise should be similar to a weighted pendulum that randomly swings on the end of a piece of string. If you have had surgery to fixate your shoulder fracture then rehabilitation at Barkman & Smith Physical Therapy will begin as soon as your surgeon recommends it. Surgical fixation aims to make the fracture site stable therefore in most cases the gentle non-weight bearing exercises mentioned above are safe to do early on and will often be recommended even immediately after surgery. In some cases, however, no exercise will be recommended until after the bone has shown some evidence of healing on X-ray (usually around six weeks.) In these cases gentle finger and wrist movements are the only exercises permitted. Each surgeon will set his or her own specific restrictions based on the type of fracture, surgical procedure used, personal experience, and whether the fracture is healing as expected. Even if extensive Physical Therapy for your shoulder does not begin immediately, at Barkman & Smith Physical Therapy we highly recommend maintaining the rest of your body’s fitness with regular exercise. If your shoulder has been surgically repaired, maintaining general cardiovascular fitness can be done with lower extremity fitness activities such as walking or using a stationary bike or stepper machine. 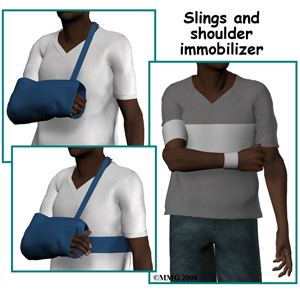 If your fracture has been treated by immobilization in a sling, activities such as these may need to wait until the bone shows some healing on X-ray due to the jarring up the bone that can occur and delay healing. In any case we will liaise with your doctor to determine an appropriate time for you to start cardiovascular activities. After surgical fixation, weights or weight machines for your lower extremity and opposite arm are also acceptable to use as long as the restrictions regarding your healing shoulder fracture are strictly abided by. Generally, lifting even light weights with your injured limb will not be allowed and will be difficult as your humerus heals so you may require a friend to assist you with your workout setup if you are keen to continue while your bone heals. Your Physical Therapist at Barkman & Smith Physical Therapy can discuss the most appropriate way for you to maintain your fitness as well as provide a general fitness program specific to your needs while abiding by your doctor’s restrictions. When the immobilizer is removed or following surgery, you may experience some pain when you start to move your shoulder, wrist, elbow and forearm. This pain is from not using the joints regularly and also likely from concurrent soft tissue injury that occurred when you fractured your shoulder. If you have had surgery, the pain may also be from the surgical process itself. Your Physical Therapist at Barkman & Smith Physical Therapy will focus initially on relieving your pain. We may use modalities such as heat, ice, ultrasound, or electrical current to assist with decreasing any pain or swelling you have around the fracture site or anywhere along the arm, or into the shoulder or hand. Due to some of the muscles of the neck and upper back connecting to the shoulder, you may also have some pain in these regions that we will treat in order to make movement of your entire upper body easier. We may also use massage for the neck, upper back, shoulder, elbow, forearm, or wrist to improve circulation and assist with the pain. The next part of our treatment will focus on regaining the range of motion, strength, and dexterity in your wrist, hand, elbow, and shoulder. If you have been immobilized, your arm will look and feel quite weak and atrophied once the immobilizer is removed. Your Physical Therapist at Barkman & Smith Physical Therapy will prescribe a series of stretching and strengthening exercises that you will practice in the clinic and also learn to do as part of your home exercise program. These exercises may include the use of rehabilitation equipment such as pulleys and poles for range of motion exercises, and light weights or resistance bands for resistance work of your upper limb. The shoulder joint is the upper limb’s link to the rest of the body so it needs to be strong and well controlled for the limb and hand to work well. We may also use an upper body bike to encourage coordinated movement of the entire upper limb. If necessary, your Physical Therapist will mobilize your joints. This hands-on technique encourages the stiff joints of your shoulder, elbow, and wrist to move gradually into their normal range of motion. Fortunately, gaining range of motion and strength once the shoulder fracture heals occurs fairly quickly. You will notice improvements in the functioning of your limb even after just a few treatments with your Physical Therapist at Barkman & Smith Physical Therapy. As your range of motion and strength improve, we will advance your exercises to ensure your rehabilitation is progressing as quickly as your healing fracture allows. Graduated heavier exercises and endurance work will be added in concordance with the known healing time of bone in order to ensure the stresses can be withstood. As a result of any injury, the receptors in your joints and ligaments that assist with proprioception (the ability to know where your body is without looking at it) decline in function. A period of immobility will add to this decline. Although your arm and shoulder girdle are not traditionally thought of as weight-bearing parts of the body, even an activity such as assisting yourself with your arms to get out of a chair or pulling a glass from a cupboard requires weight to be put through or lifted by your shoulder girdle and for your body to be proprioceptively aware of your limb. If you are an athlete, then proprioception of your upper extremity is paramount in returning you to your sport after a shoulder fracture. The proprioceptive control of the scapula on the rib cage (scapulothoracic motion) is especially important in being able to use your shoulder girdle and upper limb effectively without causing further injury. Normal scapulothoracic motion is particularly essential when using your limb near or above shoulder height. For this reason, your Physical Therapist will teach you how to properly control your scapula during everyday activities as well as during your rehabilitation exercises. Your Physical Therapist will also remind you about maintaining good shoulder posture even when sitting or using your upper limb in activities below shoulder height, such as working on the computer. Rounded shoulders in this position crowds the shoulder joint and can lead to shoulder impingement and pain. Regaining proprioception of the shoulder girdle and upper limb can requires concentrated work, as most people have not previously needed to focus so intently on such controlled motions. The concentrated effort, however, has a substantial reward, as good scapulothoracic control is the key to regaining maximum shoulder girdle motion while avoiding further shoulder problems in the future. Proprioceptive exercises might include activities such as rolling a ball on a surface with your hand, holding a weight up overhead while moving your shoulder, or pushups on an unstable surface. Advanced exercises may include activities such as ball throwing or catching overhead. For athletes we will encourage exercises that mimic the quick motions of the sports or activities that you enjoy participating in. Your Physical Therapist at Barkman & Smith Physical Therapy will liaise with your surgeon regarding the optimal time to start any advanced proprioceptive exercises. Generally, the strength and stiffness one experiences after a shoulder fracture responds extremely well to the Physical Therapy we provide at Barkman & Smith Physical Therapy. Since the normal load on the shoulder girdle is relatively light you can return to normal activities quite early on. If your sport or work activities load the arms heavily it may be three to four months before you go back to them depending on the injury and the amount of healing in your case. With our initial one-on-one Physical Therapy treatment along with the ongoing exercises of your home program, the strength, range of motion, endurance and proprioception gradually improve towards near full recovery/function over a period of 4-6 months even though the actual final stages of bone healing won’t occur for another 12-18 months after that. For most fractures of the shoulder girdle you can expect the fracture to heal and function to return to normal. If, however, during rehabilitation your pain continues longer than it should or therapy is not progressing as your Physical Therapist at Barkman & Smith Physical Therapy would expect, we will ask you to follow-up with your surgeon or doctor to confirm that the fracture site is tolerating the rehabilitation well and to ensure that if you have had surgery, there are no hardware issues that may be impeding your recovery. Complications are events or conditions, which make the process of recovering from the fracture more complex. Although most of them are rare, much of the management of the injury is directed at avoiding or reducing the extent of complications. It should be noted, however, that persistent swelling at the fracture site may be felt in the case of collarbone or breastbone fractures and there may be slight asymmetry between the shoulders. This would be considered normal. After acromioclavicular separation there may also be a persistent bump with the outer end of the collarbone riding high. More serious long-term problems that have a major effect on the management of shoulder fractures are listed below. Injury often causes bleeding into a joint. This blood clots (coagulates) but remains in the joint. Eventually the clot is transformed into scar tissue. If the joint remains immobile while this scar tissue forms, it may adhere to different parts of the joint and bind them together (adhesions). This will result in loss of range of motion (stiffness) of the joint and sometimes pain when the scar is stretched. With three joints involved in a shoulder injury it is not unusual for one or more of them to stiffen up during the recovery process particularly if the shoulder needs to be immobilized for a long period. Physical Therapy at Barkman & Smith Physical Therapy will help to avoid any stiffness developing in your shoulder. Early pendular exercises, as mentioned above, are particularly important in avoiding stiffness as a complication. At the earlier stage where a blood clot has not yet transformed into an adhesion, the tissue has no strength and can easily be stretched. It is also painless at this stage, as the developing adhesion has no nerve supply so it is the best time to stretch it out. Later on the adhesions can be stretched via Physical Therapy mobilizations but this is slower, can cause some discomfort, and may not be completely successful. Thus, avoiding adhesions and maintaining early motion (as allowed by your doctor and Physical Therapist) is the best form of treatment to avoid shoulder stiffness. Injuries to the brachial plexus were referred to above. If the injury is complete the prognosis for full recovery is poor as the nerves have a long way to grow before they re-attach to their "targets" in the hand and forearm. Even after surgery to repair the nerves, the outcome cannot be predicted. More often the injury is that of a stretch to the nerve and recovery is slow but complete. If a brachial plexus injury does not fully recover, the treatment depends on the disability and the needs of the patient. Muscle transfer operations to restore the function of the elbow and hand may be needed. Injury to the axillary nerve, which can occur after shoulder dislocation or an ORIF surgery, usually recovers. After an open fracture, there is a small risk (2% or less) that the contamination at the time of the injury will result in a bacterial infection of the surgical site. If the wound remains swollen, tender and red longer than normal an infection must be suspected. A fever may occur and pus may accumulate in the wound or drain from it. Your doctor and Physical Therapist will closely monitor how your surgical wound is healing to watch for these signs of infection, which require immediate attention. A culture of the pus or blood cultures may isolate the bacteria causing the infection. High doses of antibiotics for an extended period are required if an infection is present. It is often necessary to repeat surgery to remove contaminated and non-viable tissue, wash out the wound and drain it. Antibiotic beads are often placed in the wound so there is a high local concentration of the drug. With early aggressive management it is usually possible to suppress or eliminate the infection until the fracture heals. At that point removal of any remaining metal implants usually allows the infection to heal completely with no long-term consequences. Where an infection of bone is incompletely healed, it may be quiescent for some years and flare up later when the patient is stressed. After dislocation of the glenohumeral joint the ligaments may be pulled off the front of the glenoid and do not re-attach securely. The shoulder is then at risk for repeated dislocations, each of which will further stretch and damage the structures that normally prevent dislocation. This situation frequently results in surgery to reconstruct or re-attach the ligaments. Recurrent instability may also occur at the acromioclavicular joint and the sternoclavicular joint if they have been injured. Treatment of these problems depends on the individual situation. Malunion means that the fracture heals in an incorrect position. This is frequently asymptomatic; the scapula often unites with fragments overlapping or rotated. However, because the scapula acts primarily as a site of attachment for muscles the new shape does not affect function and is rarely noticeable. The collarbone is just under the skin and any malunion can be felt as a swelling or overlap in the area. In rare cases small pieces of bone (spicules) from an angulated clavicle fracture may work their way through the skin and may need to be trimmed off. The most detrimental problem with malunion occurs in relation to a joint. 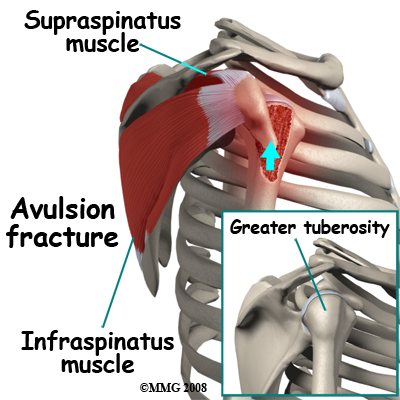 If an avulsion fracture of the greater tuberosity heals malunited it may impinge on the acromion process when the arm is lifted to the side. This situation can be treated with surgery to recess the tuberosity back into position and fix it. If the fracture involves the joint surface itself malunion may mean that the joint surface is irregular. This predisposes the joint to early post-traumatic arthritis. 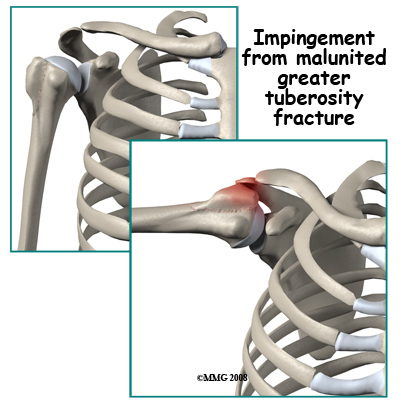 If the malunited fracture involves the glenoid it may be possible to operate to move the fragment back into position and make the joint surface smoother. Due to problems with the blood supply this may not be advisable in the case of malunited fractures of the head of the humerus. When a fracture has failed to heal and will not heal without further intervention it is called a nonunion. This is unusual in all the bones of the shoulder girdle except the collarbone. Even in the collarbone it is rare but can be troublesome with pain and tenderness limiting function of the arm. Treatment involves surgery, bone grafting and fixing the fracture with a plate and screws. This procedure is successful in healing the fracture 90% of the time. Due to the possibility of nonunion and concerns about malunion of the collarbone some surgeons are recommending ORIF for the initial injury in selected patients. When a collarbone has been treated with an ORIF the plate is usually just under the skin. It is uncomfortable, especially with shoulder straps, and it may be necessary to do a second operation to remove the plate. Nonunion in proximal humeral fractures occurs in the context of fixation failure (see below). Metal that is repeatedly stressed will eventually undergo fatigue failure. It is similar to wiggling a wire up and down until it breaks. This occurs also in metal implants used in fracture treatment. The "wiggle" is supplied by micro-movement at the fracture site. It is a race between the bone healing and the metal failing, of which the bone usually wins. 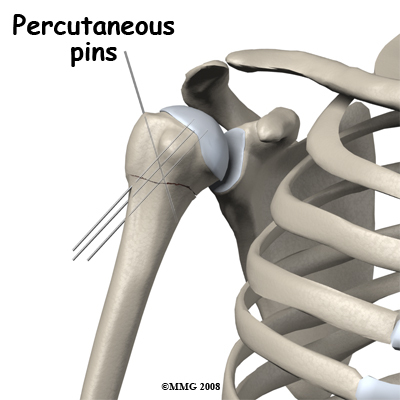 In cases of delayed or non union, cases where the fixation is weak, or cases where the shoulder is loaded early before the bone has healed, the hardware may fail. This is the reason for restrictions on using the shoulder too early. Even though the shoulder may feel painless and strong, if it is still dependent on the metal for its strength, it makes no sense to test that strength. Hardware failure can sometimes be treated non-operatively by resting and immobilizing the shoulder and expecting healing to progress. Often, however, it requires repeat surgery. The restrictions on activity imposed by your surgeon and Physical Therapist are aimed at avoiding this complication. Another problem that is specific to the shoulder region is the quality of the bone. Many fractures occur in the elderly with osteoporotic bone. Bone that is osteoporotic does not hold screws well and loss of fixation can occur when screws pull out of the head of the humerus. Modern plate designs with locking screws are aimed to avoid this problem but this is only partially successful. Failure of fixation for any reason makes nonunion or malunion more likely to occur. A joint surface will wear out prematurely when a joint has not moved for a long time, if the joint surface was damaged as part of an injury, or where the joint surface is an irregular one. This is called post-traumatic arthritis. The shoulder will become aching and painful to move or load, the range of motion of the joint will become restricted, and the x-rays will show loss of joint surface, spurs, and loose bodies in the joint. This process takes years but may be a severe functional problem in a younger patient. The symptoms can be treated with pain medication and anti-inflammatory medication (NSAIDs.) Physical Therapy is helpful in retaining range of motion and regaining normal use of the shoulder. In cases with severe pain a shoulder replacement may offer the best outcome. 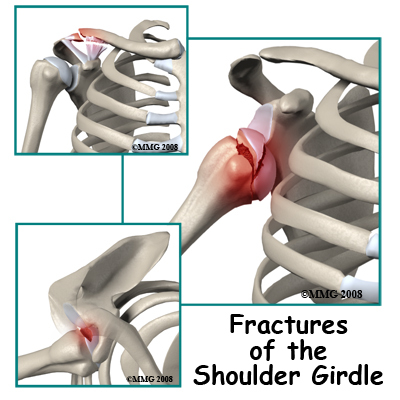 There are a wide variety of fractures that can affect the shoulder girdle. Many of them recover well without major intervention but some fracture patterns affect the joints and require close attention to ensure the best possible outcome.